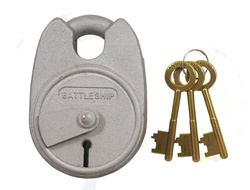 Formally the Chubb Battleship padlock it is know made by Union but is basically the same. The brand name can be confusing but if you assume Chubb, Union and Assa are all the same it makes it much easier. You may be asked by your insurance company to get a padlock with at least 5 levers to satisfy their conditions. Quite often the insurance company actually requires 5 or more pins, since nowadays most locks use this type of locking mechanism. However, we have found that some are adamant and still require the lever setup. 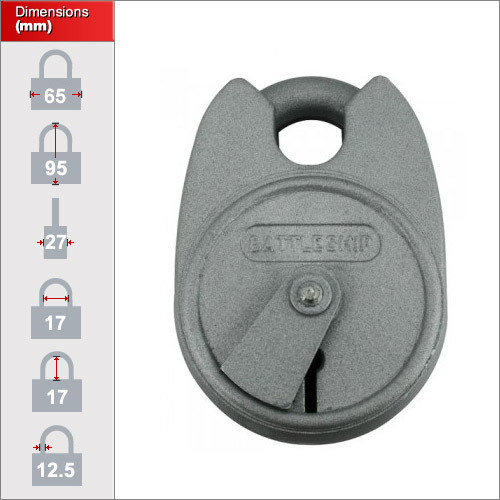 For this reason this lock is still manufactured and adheres to those conditions with 6 levers. The keys that operate this lock look similar to those used on older style mortise door locks. Each lock is delivered with 2 keys. Although dated in terms of the locking mechanism since it uses lever type keys, what makes it so strong is the quality of construction. Make in the UK it undergoes English quality inspections and is made from graded hardened steel. This is very important for defense against cutting in a padlock. Interestingly, take a look at this photo of vintage collectable locks below from over 40 years ago. Look familiar? Don't be put off by the fact they have barely changed in all that time, afterall, in security the simple things are often better.